The SAAB 340 is a twin-engine transport aircraft with a max payload of 3200 kg or up to 3 crew and 35 passengers. Development of the SAAB 340 started in 1980 as a cooperative venture between SAAB-Scania from Sweden and Fairchild Industries from the USA. Development studies on a 30 to 40-seat commuter airliner resulted in the SF340 design that was launched in September 1980. Within the 65/35 SAAB/Fairchild partnership SAAB was responsible for the fuselage, fin and final assembly, while Fairchild was responsible for the wings, tail surfaces and the engine housings. The two companies selected the General Electric CT7 turboprop engine to power the new airliner. SAAB was also responsible for the systems integration, and flight-testing. The first SF340 prototype, s/n 001 SE-ISF, was flown on 25 January 1983. The first production aircraft, s/n 003 SE-ISB, was flown on 25 August 1983. Certification was completed on 29 June 1984. SAAB SF340A s/n 005 was the first delivered, and it went to Crossair on 6 June 1984. From 1 November 1985, SAAB assumed overall responsibility for the SF340 following the decision of Fairchild to divest itself of its aircraft divisions. SAAB initially retained the SF340 designation but later changed it to 340A. The aircraft was offered in an air transport configuration and an executive version. From the first deliveries, SAAB has continually developed and improved the aircraft. In 1985, an upgraded 340A version with increased MTOW was offered, and provision made for existing aircraft to be modified. In 1987, a freighter version 340QC (Quick Change) and in 1989, the 340B were introduced. The 340B again features upgraded engines, increased MTOW, and enlarged tail surfaces. For the Swedish military the SAAB-340AEW Erieye version was developed. Further developments include larger wings, and a 50 seat follow on version, the SAAB 2000 that flew in 1992. The last development of the 340 was the 340B Plus that introduced changes developed for the larger SAAB 2000. The first 340B Plus was delivered in March 1994. Production of the 340 ended in 1999, with a total of 459 airframes built. Sky Taxi was established in 2000, and operates two aircraft, a SAAB 340A QC and a PZL M20 Mewa, out of Wroclaw in Poland. Sky Taxi operates charter and air taxi flights. 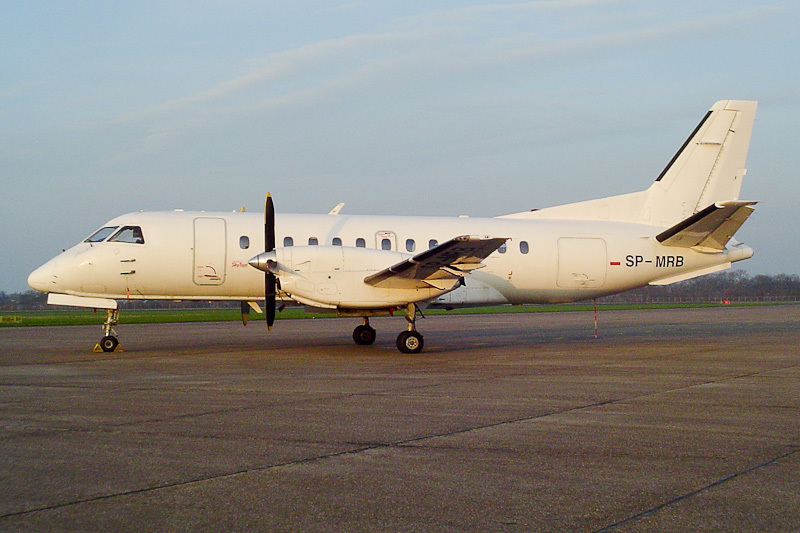 On 31 January 2007, their all-white SAAB 340A QC SP-MRB (s/n 100) came in at Groningen Airport Eelde in the Netherlands on a flight to Roskilde in Denmark. On 8 August 1987, the SAAB 340A c/n 100 was flown first as SE-F01. Before the aircraft was delivered as a SAAB 340A QC to Sky Taxi in November 2005, it was operated as SE-ISK, G-GNTD and OE-GIF. In December 2005, the airliner entered service with Sky Taxi as SP-MRB.